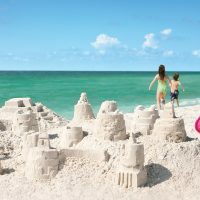 Sure, all-inclusive resorts make relaxing family vacation destinations. 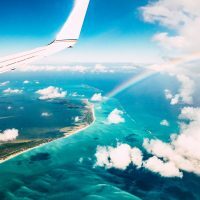 But when the beach gets boring and you’re ready for some adventure, break out of the all-inclusive Caribbean resort mold to take your tweens and teens on an excursion they won’t shrug off. The 3,792-foot Mount Liamuiga, the highest point on the East Caribbean isle of St. Kitts, looms like a challenge: a 2,800-foot climb on a seven-hour excursion. Hire a guide (try Greg’s Safaris) and wear sturdy shoes and loose clothing, preferably those you wouldn’t mind throwing in the trash afterward. Long sleeves and lunch feel good when you reach the crater. Bring water and a towel. You’ll likely get caught in a shower in the rainforest, especially in early spring. It’s a long, steep, often muddy trek up and down the mountain, one that occasionally has you going down on all fours like the green vervet monkeys you see in St. Kitts’ jungled rainforest. But the lush sight of a mile-plus-wide crater and surrounding countryside at the top provides the reward. If you like snorkeling, it’s time to take the next step with a Discover Scuba course, often referred to as a resort course. 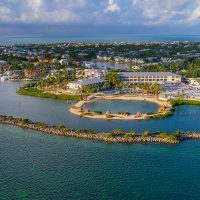 Sure, some all-inclusive resorts offer these, but the UNEXSO operation on Grand Bahama Island has been making a name for its competence since 1965. The four-hour adventure begins in the pool with lessons teaching the basics of breathing, buoyancy, hand signals, and skills needed for an open-water dive that will follow. Instructors stay by your side during the 20- to 40-foot dive. Prepare for a rush of excitement and cooldown splash at this iconic, natural adventure. It takes about an hour or so to climb up the 500-foot falls from sea level, picking your way atop steep, slippery rocks with the help of a group guide. Along the way, rock slides and powerful surges provide thrills and challenges. Tips: Plan to visit early in the day, preferably on light cruise-ship days, to avoid busloads of tourists. Water shoes are required. You can buy them at the attraction, but you may want to bring your own. Dean’s Blue Hole is said to be the deepest inland blue hole in the world at 663 feet. Bordered by towering limestone cliffs, a beach, and the sea, the hole experiences strong currents that make swimming across its mouth adventure enough for some. Free divers from around the world come here to compete at biannual tournaments, diving from the 30-foot cliffs. The less daring go feet first into the mysterious hole that appears bottomless. Here’s another get-your-hands-dirty—and every uncovered spot and crease in your face—adventure. Road dust has a new meaning as you bounce along desert landscape in Aruba’s “outback.” You or your driving-age teen pilots your own 4×4 Jeep on this rollicking tour that takes you through dunes, cacti forests, gold mine ruins, bizarre boulder formations, and secluded beaches. 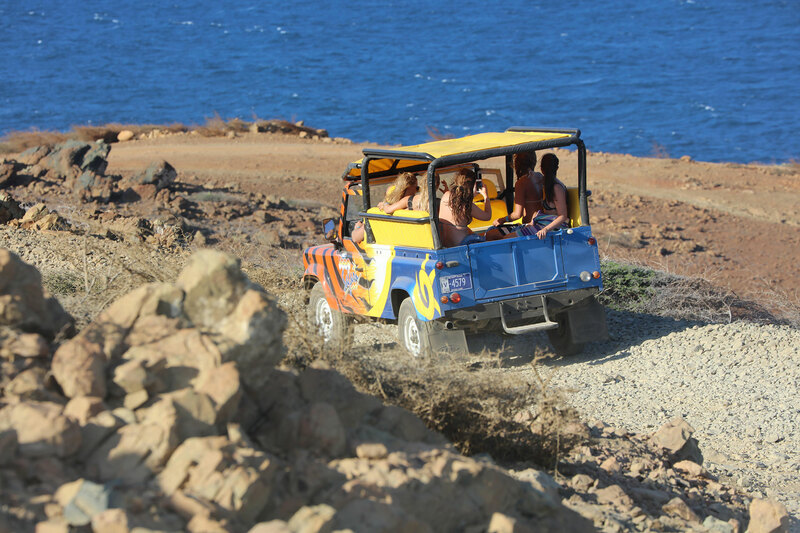 Choose from half- (four hour) or full-day (9.5 hours) and group or private excursions with ABC Tours Aruba. What probably will hurt most after your bike ride down 1,740-foot Sage Mountain? Your hands. The greater part of the ride consists of braking to maintain a slow enough speed, especially at first. Your guide sets the pace once your confidence allows a little more speed, stopping at intersections to regroup. Around the hairier than hairpin curves, the guide gives a “clear” or “car coming” report to those behind. The ride requires only an occasional upshift to climb inclines. The scenery ranges from dizzyingly breathtaking to seaside exquisite. BVIScuba.org provides the equipment, ride to the top, and guided glide to the sea. It’s eerie and just enough frightening. Stuart Cove’s Dive Bahamas takes your family offshore to snorkel three different sites. 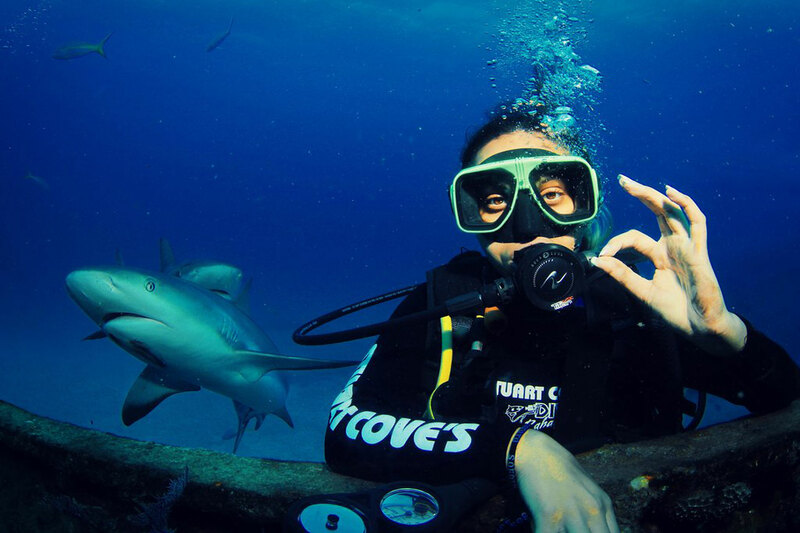 The staff warms you up on pretty, fish-flitty reefs, and then—dun-dun-dun—comes your date with some 30 reef sharks. Buckets of chum dropped to the sea’s bottom attract the mostly harmless sharks. Snorkelers must slip quietly into the water without splashing or flipping and hang onto the bow rope to float on the water’s surface and spectate the feeding frenzy 30 feet below. An infinitely tamer water adventure, the thrill of cave-tubing at Jaguar Paw in southern Belize is drifting through the dark. The ride involves a small patch of easy rapids, but the main attraction comes as you enter the cathedral-like limestone caves. Your guide equips you with headlamps, and everyone in the group hooks up using their feet. You will hear traditions and beliefs of the Maya, who used these caves to make sacrifices to their gods. At one point, everyone turns off their lights and absorbs the aura of the place, palatable to even skeptical teenagers. Springs feed the Cave Branch River, making it not only revelation-clear, but baptismally refreshing. Too tame for your teens? You can package your cave-tubing experience with zip lining, Maya ruins exploration and other adventures. 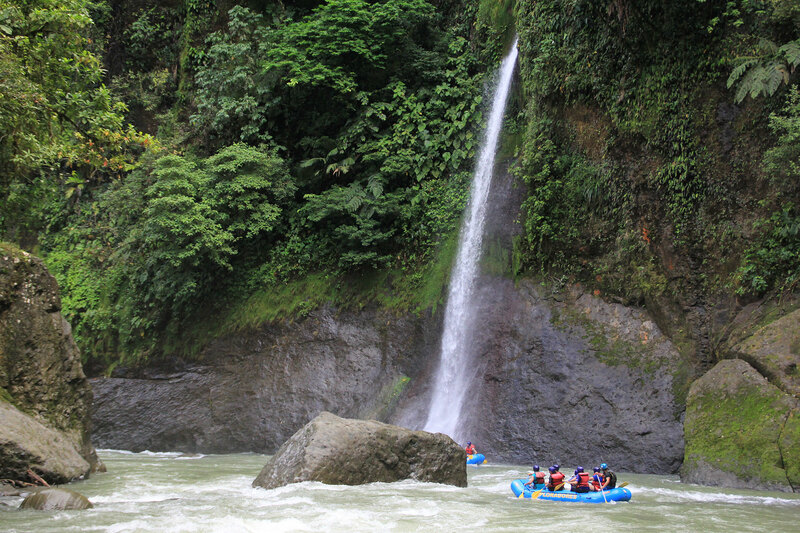 From one- to six-day adventures on the Pacuare River in mid-eastern Costa Rica, excursions with Rio Tropicales are well-suited to families and first-time rafters. The outfitter, a Costa Rican whitewater rafting pioneer, owns 2,000 acres of surrounding rainforest with a rustic lodge and activities for spending days between rafting excursions. Meals come with the multi-day packages as do adventures including canopy ziplining, mountain horseback riding, waterfall rappelling, rainforest hiking, and a swing bridge over the river. Waterfalls, dramatic cliffs, wildlife, and rapids up to class-4 add beauty and excitement to the rafting. Canyoning marries cascading and rappelling into one thrill sport. Iguana Mama offers both canyoning and cascading (without rappelling equipment) excursions into the mountains and ravines of DR. The waterfall cascading tours have you jumping off cliffs up to 30 feet high, sliding down rocks, and swimming. The Magic Mushroom tour is purely canyoning, starting with easy rappels and building in intensity, with the opportunity also to just jump.